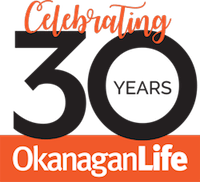 For over 30 years, Byrne Publishing Group Inc. has published Okanagan Life magazine, the Okanagan region's most established and best-read colour glossy magazine. Okanagan Life reaches readers in every community from Salmon Arm in the north Okanagan to Osoyoos in the south. Most readers of Okanagan Life reside in the communities of Kelowna, Vernon, Summerland and Penticton. Okanagan Life captures the essence of life and lifestyles in the Okanagan with informative and entertaining features on issues that matter to people who live or vacation in the Valley plus regular stories on Okanagan destinations, personalities, wine, food, history, outdoor recreation and much more. Circulation Okanagan Life magazine is distributed to 16,000 Okanagan Valley homes, businesses, newsstands and subscribers making it the only city or regional magazine in North America to exceed the circulation of the region's largest daily newspaper. Okanagan Life's marketing area covers targeted Okanagan residences and businesses with special emphasis on the Central Okanagan. Our reach includes: Armstrong, Enderby, Kaleden, Kelowna, Lake Country, Lumby, Naramata, Okanagan Falls, Oliver, Osoyoos, Peachland, Penticton, Salmon Arm, Sicamous, Summerland, Vernon and West Kelowna.